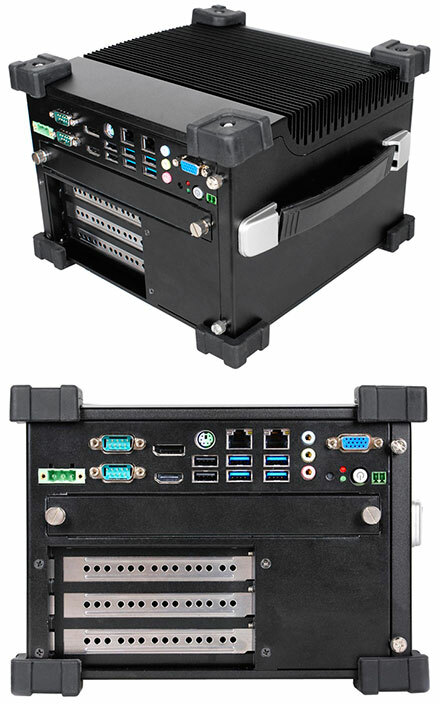 The HM-1000 Fanless Expandable Embedded Computer System is designed for target markets such as industrial automation control, video surveillance, and industrial vision and vehicle systems. The HM-1000 as a barebone system that resellers and system integrator partners can customize with their own high performance fanless processors, choice of PCI or PCI Express expansion slots, and the ability to install an optional expansion module to add more Ethernet, GPIO, USB ports or serial ports. The HM-1000 is a high-performance system based on the Intel Q87 Haswell platform, supporting a fanless Intel Core i3, i5, i7 processor in the LGA1150 socket up to 65 watts. The system comes with 4GB of DDR3 memory onboard, this memory is not expandable in order to help this system be more rugged and vibration-resistant. There will also be a version with 8GB available for OEM customers. The HM-1000 is a wide-temperature, from -10°C to 60°C, fanless system, there are no moving parts, unless of course a customer installs a spinning 2.5” hard disk. The chassis is made from aluminum and has large rubber bumpers on the corners to help make the system more rugged and vibration-resistant. In addition, the inside of the system is cable free and modularized for a clean look and improved thermal performance and also to help make the system more rugged. The base barebone system comes with three expansion slots, 1 for PCI Express by 16 and two 32 bit PCI slots. There will also be other riser card options available. Internally, this system supports one 2.5” serial ATA device in addition to an M.2 SATA connector for SSD. It also has one full-size mini PCI Express slot for WIFI or other mini PCIE Express cards.